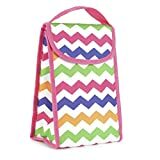 Quality Personal Cool Lunch Bag Ideal for the beach, camping and picnics. Quality Personal Cool Lunch Bag, Perfect For Keeping Your Lunch at an Ideal Temperature. 600D Polyester With PVC Wipe-Clean Foil Lining To Aid Insulation. Tough Carry Handle and Velcro Top Closure.